Begin on your back on the floor, the band looped around your waist. Place your hands inside the band. 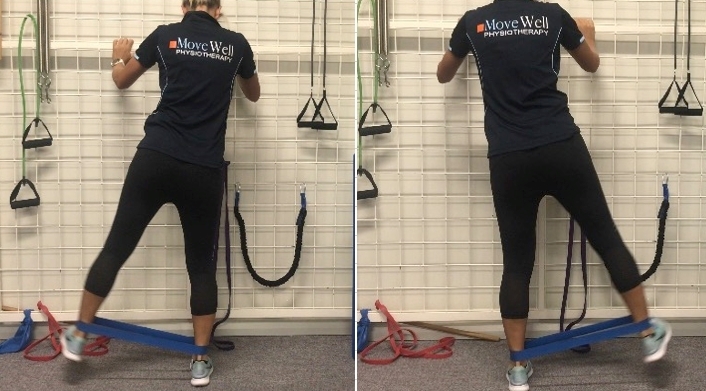 Hold the band on the ground with your hands as you push your hips towards the ceiling. Engage your glutes and hold for 3 seconds then slowly lower your back down. Anchor a resistance band to bar/machine. Loop the band over your hip bones. Kneel down and take a suitable weight and hold it as if you were hugging the weight/KB. When in correct position tilt trunk forwards and then slowly return to starting position- pushing your hips through squeezing your glutes for 3 seconds then tilt forward again. Begin standing wrapping the mini band around your legs just above your ankles. If you struggling with balance you can hold onto a chair. Lift your right leg out to your side, flexing your foot and keeping the working leg straight. Begin by placing weights or tape in a diagonal formation on the ground. Loop the band around your legs. The lower you place the band, the harder the walk will be. Instead of bringing your feet close together- you are going to take a wider stance. Take a big DIAGONAL monster step to the right, hold this position then take one big diagonal monster step to the left. Once you have taken x4 steps on either side, you are going to do the same thing but take diagonal steps backwards. Begin lying face down on the floor, your band looped around your ankles. Lift one flexed foot toward the ceiling, engaging your glutes against the band resistance. AVOID ARCHING YOUR BACK. 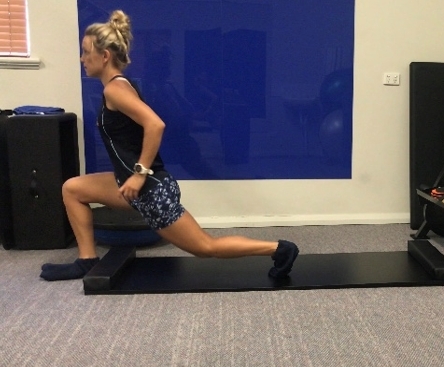 Your hamstrings may also be felt during this exercise. Begin by looping your band around a sturdy object, keeping one end free to place your foot in. Get on all fours (hands directly beneath your shoulders and keep knees directly beneath your hips) and secure your right foot in the band. Fully extend your leg behind you, then return to starting position. Be sure to focus on engaging your glutes by flexing your foot throughout the movement. Add difficult to this exercise by keeping your leg extended behind you and pulsing up and down. Begin on your back on the floor, your mini band looped around your waist. Place your hands inside the band, holding it on the floor. Push your hips towards the ceiling and extend your right leg out and off the floor. Engage your glutes and hold for a beat at the peak of your bridge. Lower your leg. This is an awesome exercise if you want to increase your power. Attach a band to a stable object. Start by looping the band around your hips (face away from where the band is anchored). Take the weighted bar and start by lowering the weight down by keeping your knees slightly bent and as you feel your hamstrings working, stand up and push your hips through. Pause in this position and make sure that you feel your glutes. Lower the weight back down and repeat. 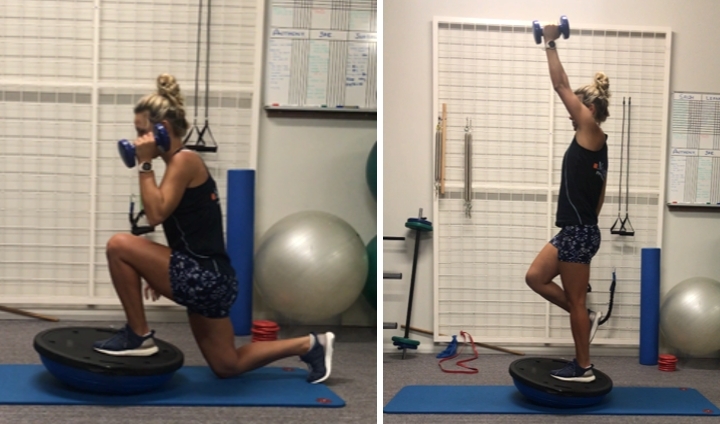 Lie on your back with your right foot resting on the bosu. Hold a suitable weight in your right hand. When you are in position you are going to push your hips up to the ceiling using your right leg only. Then when stable extend your opposite arm (with the weight) and opposite leg and bring them together. Lie flat on your back and place the foam roller between your legs, keeping knees bent. Hold a weight with both hands overhead. Bridge up by pushing your hips up to the ceiling squeezing the foam roller and exercising your glutes whilst bringing the weight forward to in line with your chest and then back behind your head again. Hold a suitable weight in your left hand. Stand on the upside down bosu ball with your left leg. When you are ready lunge backwards with your right leg and explode up keeping your balance on your left leg. You will use narrative arm/leg movement as if you are trying to mimic a run.